The layout and design of your workspace calls for expertise in space planning and employee needs assessment. Proper office design can affect much more than just the aesthetics of your office environment. It can improve work flow, enhance productivity and efficiency, boost morale, improve employee retention rates, promote team development, and break down employee-management barriers. Cubicles Plus Office Furnishings (CPOF) designers are trained and certified on the industry-standard Giza space planning and design software system. They will convert your ideas into detailed floor plans and three dimensional views, ensuring your work flow and productivity objectives are met. Photo-quality color renderings are also available. There will be no surprises as to what your office space will look like the day after installation. Utilizing any and all types of furniture products, CPOF can design and plan every area in your office space including open office plans, private offices, conference/break rooms, training/multi-task rooms, mail rooms, and reception areas. CPOF also takes into account your ergonomic, acoustical, and internal/external customer needs throughout the design process. 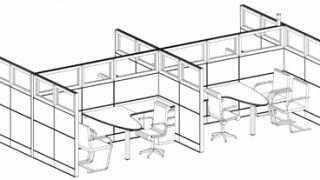 Cubicles Plus Office Furnishings (CPOF) installs virtually all makes and models of cubicles and office furniture. Our service personnel have on average 20 years industry experience per individual. Unlike larger furniture dealers that must focus on meeting sales quotas with their specific cubicle providers, CPOF addresses every cubicle reconfiguration project with the client’s best interest in mind. We make product recommendations based on product longevity, quality, and long-term availability when examining these complex time & materials projects. 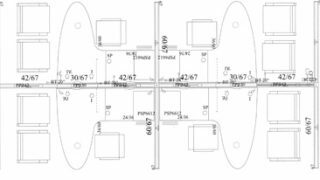 Our space planners who provide the “roadmap” installation drawings and details are well-versed in all cubicle manufacturer specifications. With the dramatic increase in open plan office layouts, acoustic challenges have also grown to a level never experienced previously in workplace environments. Cubicles Plus Office Furnishings is a licensed reseller and team member with two established and proven sound masking manufacturers, identifying, analyzing, and resolving acoustical distractions in modern open office spaces.